What is Name a Rose? Golden, Diamond or Silver Anniversary Roses available, We can print your picture onto the plant label. A unique personal gift for an anniversary gift. You can add a photo to any of the Anniversary Rose Bushes, just send over your scanned picture using the form below and we will upload onto a Rose Label-for Free! The Rose you choose comes with a bottle of Champagne. Make this gift even more personal by uploading your photo on our website and we will print your photo onto the plant label which is attached to rose bush, it is waterproof and frost proof, the rose bush is gift wrapped and potted. We do our best to get your order to you on the date required but once your plant leaves us it is down to the courier. We do not deliver on Saturday, Sunday or Monday and for Bank Holidays we will dispatch the day after bank holiday and deliver day after that. and Delivery Information before purchasing an item. I would just to say my mum was delighted with her personal named rose bush with a picture of our darling dog, Bengi. Anniversary roses make an ideal gift. 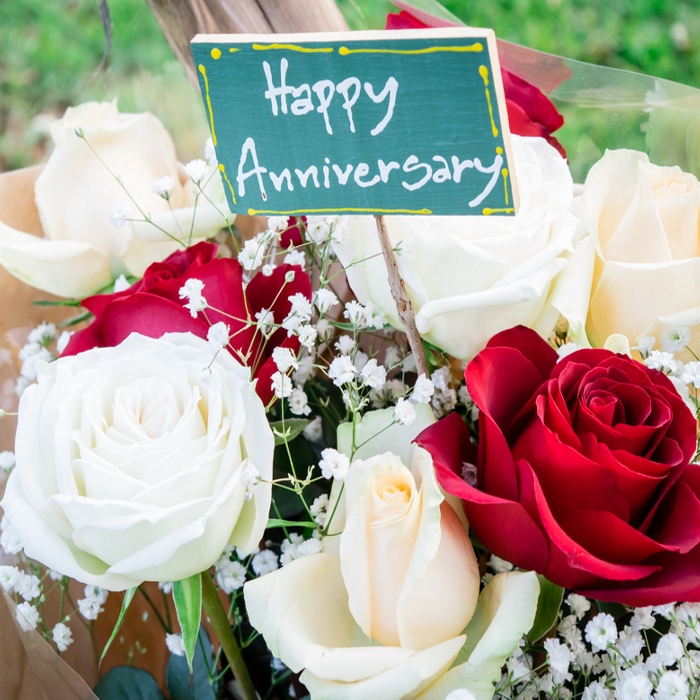 Choose from Golden, Ruby, Diamond or Silver Anniversary Roses.